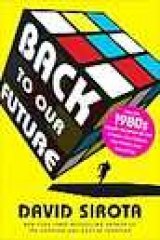 David Sirota, author of "Back to Our Future: How the 1980s Explain the World We Live in Now -- Our Culture, Our Politics, Our Everything" (Ballantine Books, 304 pages, notes, glossary of 1980s, $25.00) may be on to something. After all, there's a new version of a movie I -- and probably most people -- never expected to see remade, the 1981 hit "Arthur." Russell Brand, who's my height, 6-1, plays Arthur Bach, originally acted by the five-foot plus Dudley Moore, and Helen Mirren takes over the John Gielgud role. No, I haven't seen the 2011 "Arthur" yet, but the Christopher Cross "Arthur's Theme" from the 1981 version with lyrics like "stuck between the Moon and New York City" is boring through my brain like an earwig! Mark Twain was wrong, says Sirota: quite often history does repeat itself, with minor variations. The savings and loan scandal of the 1980s bears many similarities to parts of the Great Recession of 2008, which actually began a year or so earlier and, for most people, if not the undeserving rich of Wall Street, is still continuing with high gasoline prices, unemployment, record foreclosures and declining home prices, and record credit card debt. Twain's second quote, which I discovered and cited above, was apropos of two lies from the era, the "Spat Opon Returning Vietnam" vets and the "We could have won the war if we didn't fight it with one arm tied behind our back" syndrome, which Sirota says are back referencing our current 2 1/2 wars, if you count Libya as a covert operation like the Central American adventures under Ronald Reagan in the 1980s. Careful research finds no documented cases of returning veterans being showered with spit; the tonnage of bombs and Agent Orange used in Vietnam belies the "stab in the back" belief expressed by the "one arm tied behind our back" types. Some wars are unwinnable, as a general or two cited by Sirota affirms. The French couldn't win in Indo China and neither could we. There's no way we can "win" in Iraq, Afghanistan or Libya, either, in my opinion. So hop into Doc's DeLorean, fasten your seat belt and get ready for deja vu all over again as you contemplate a present that Sirota says was shaped in the larger-than-life pop culture of the 1980s, from the "Greed is good" ethos of Gordon Gekko (and Bernie Madoff) of Oliver Stone's "Wall Street" (and the 2010 sequel "Wall Street: Money Never Sleeps") to the "Make my day" foreign policy of Reagan (and George W. Bush) to our Bill Cosby inspired President Barack (Cliff Huxtable) Obama. The more you look at the 1980s, when many of today's leaders were kids or young adults, the more Sirota's thesis that much of what's happening today owes its existence to a 1980s generation weaned on Rambo one-liners and the Nike sneaker "Just Do It" philosophy makes sense. Comic books, cartoons, video games and children's toys were instruments of cultural indoctrination, he says. Hollywood and the networks, which conventional wisdom says are run by liberals and bleeding-heart types, gave us productions like "Back to the Future," "Family Ties," and "The Big Chill," which re-imagined the 1950s as America's lost golden age, at the same time vilifying the 1960s as the source of all our woes. Sirota says conservatives make use of "Family Ties" star Michael J. Fox (also the star of the "Back to the Future" movies) playing Alex P. Keaton and assailing Barack Obama as an out-of-touch 1960s hippie, which is ridiculous considering that Obama was born in 1961 (in Hawaii!) and came of age in the 1980s. True, he did hang out in Chicago with 1960s radicals like Bill Ayers and former suburban Milwaukee cheerleader and Weather Underground terrorist Bernadine Dohrn, but that's another book. Sirota quotes another American literary giant, William Faulkner, who famously said "The past is never dead. It's not even past." This leads Sirota to make some broad generalizations such as the current lack of objectors to our military adventures. I've seen many statements of "whoa, Nellie" opposition to the latest one in Libya by progressive Democrats like Rep. Dennis Kucinich, D-OH, and the always-opposed-to-foreign-military-adventures Rep. Ron Paul, R-TX. Whether you agree with Sirota's thesis or not, this is a very readable book that will refresh your memory, if you lived through it, or inform you if you're too young, about the fabulous 1980s. That end of book glossary is a big help. David Sirota is a journalist, nationally syndicated weekly newspaper columnist, and radio host. His weekly column is based at The Denver Post, San Francisco Chronicle, Portland Oregonian, and The Seattle Times and now appears in newspapers with a combined daily circulation of more than 1.6 million readers. He has contributed to The New York Times Magazine and The Nation and hosts an award-winning daily talk show on Denver’s Clear Channel affiliate, KKZN-AM760. He is a senior editor at In These Times magazine and a Huffington Post contributor and appears periodically on CNN, The Colbert Report, PBS, and NPR. He received a degree in journalism and political science from Northwestern University’s Medill School of Journalism. He lives in Denver with his wife, Emily, their son, Isaac, and their dog, Monty. His website is www.davidsirota.com.